The iconic British motivational poster that took 60 years to become so. Perfect wall decor for any household. Dr. Seuss became famous worldwide with his children's books, but few know the work Theodor Seuss Geisel did as a political cartoonist during WWII. In the extraordinarily trenchant cartoons in this book, Geisel presents a provocative history of wartime politics. Spain: Day 358 of 985 of the Spanish Civil War. CBI - China: Day 3 of 2,987 of the 2nd Sino-Japanese War. Day 3 of 33 of the 2nd Battle of Hebei. Day 3 of 3 of the Lugou Bridge Incident. The Chinese defeat the Japanese at Peking. Spain: Day 723 of 985 of the Spanish Civil War. CBI - China: Day 368 of 2,987 of the 2nd Sino-Japanese War. Day 29 of 139 of the Battle of Wuhan. CBI - China: Day 733 of 2,987 of the 2nd Sino-Japanese War. Day 26 of 68 of the Battle of Tianjin. CBI - Mongolia: Day 60 of 129 of the Battle of Khalkhin Gol, a border dispute between the Soviet Union and Japan. UK: The British House of Commons passes War Credits of £1,000,000,000. Atlantic: The British sub HMS SALMON is lost southwest of Stavanger, Norway. She is presumed to have hit a naval mine. Atlantic: The German raider KOMET leaves Bergen, Norway, for operations in the Pacific via the Northwest Passage in the Arctic Ocean, assisted by Russian icebreakers. Atlantic: German sub U-34 sinks the Estonian ship TIIU southwest of Ireland. In the same general area, U-43 sinks the British ship AYLESBURY. 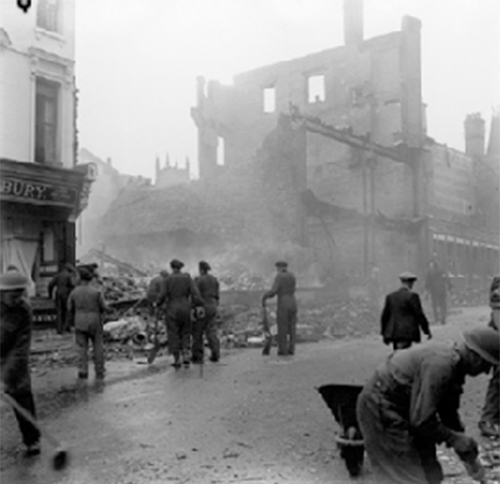 ETO - UK: Due to heavy losses, the RAF officially begins bombing Germany at night, instead of running daylight raids. ETO: The Luftwaffe attacks shipping in the English Channel and off the British coast. MTO - Italy: British and Italian fleets engage briefly in the Battle of Cape Spartivento, 50 miles south of Italy. Although no ships are sunk and the Italian ships sustain the most damage and withdraw first, they get to claim victory because the British have failed to continue to their original destination of Malta. East Africa: Day 30 of 537 of Italy's East African campaign in the lands south of Egypt. CBI - China: Day 1,099 of 2,987 of the 2nd Sino-Japanese War. Day 238 of 381 of the Battle of South Guangxi. USA: The US Congress authorizes the funding of $14,990,000 for the construction of Marine Corps Air Station Cherry Point in North Carolina. South America: Day 5 of 27 of the Ecuadorian-Peruvian War, a territorial dispute between Peru and Ecuador. Atlantic: President Roosevelt announces that US troops are to relieve the British troops in the occupation of Iceland. Adolf Hitler responds by publicly noting that this is a clear act of aggression against Germany. However, Hitler rejects the idea of his Navy attacking American vessels. ETO - UK: The British Air Ministry instructs Bomber Command to concentrate their efforts against the German transportation system and break the morale of the civilian population. At night the RAF bombs Münster, Germany. Russian Front - Finland: Day 11 of 142 of Operation SILVER FOX, a joint German-Finnish campaign to capture the Russian port of Murmansk in the Arctic. Russian Front - Finland: Day 9 of 140 of Operation ARCTIC FOX, a joint German-Finnish campaign against Soviet Northern Front defenses at Salla, Finland. Russian Front - Finland: Day 18 of 164 of the Battle of Hanko. Russian Front: Day 18 of 167 of Germany's Operation BARBAROSSA, the invasion of the USSR. Russian Front - Center: Day 4 of 31 of the 1st Battle of Smolensk, Russia. German Army Group Centre captures Vitebsk, Byelorussia, as they head for Moscow. Russian Front - South: Day 8 of 21 of the Battle of Bessarabia, Russia. German and Romanian troops continue their attack at Bessarabia to take the land and city that Romania was forced to cede to the USSR a year ago. Russian Front - South: In Ukraine, German Army Group South continues their drive into southern Russia. MTO - Libya: Day 91 of 256 of the Siege of Tobruk. Middle East: Day 32 of 37 of the Battle for Syria and Lebanon. The French High Commissioner in Syria, General Henri Dentz, appeals to British authorities to begin peace discussions. East Africa: Day 395 of 537 of Italy's East African campaign in the lands south of Egypt. CBI - China: Day 1,464 of 2,987 of the 2nd Sino-Japanese War. Atlantic: Day 13 of 14 of Germany's Hunt for Allied Convoy PQ-17. During this hunt, U-boats and the Luftwaffe will sink 24 merchant ships. The remaining convoy is still in the Arctic Ocean, taking the long way to Russia. ETO - UK: US 8th Air Force P-38s arrive in the UK via the Northern Atlantic route. This marks the first time a single-seat USAAF aircraft had flown this route. Russian Front - Finland: Day 2 of 3 of the Battle of Someri. The Finns repel the Soviet attack at Sommers in the Gulf of Finland. Russian Front - North: Day 305 of 872 of the Siege of Leningrad. Russian Front - North: Day 66 of 658 of the Siege of the Kholm Pocket. Russian Front - Center: Day 8 of 22 of Germany's Operation SEYDLITZ, a plan to trap and capture numerous Soviet troops. Russian Front - South: Day 12 of 27 of the Battle of Voronezh, Russia. German Army Group South begins their drive toward Stalingrad. Russian Front - South: Day 12 of 150 of Germany's CASE BLUE, the failed offensive to take the Caucasus oil fields. MTO - Egypt: Day 9 of 27 of the 1st Battle of El Alamein. The Germans renew their attacks, but are bogged down by stiff British resistance. East Africa: Day 66 of 186 of the Battle of Madagascar. CBI - China: Day 1,829 of 2,987 of the 2nd Sino-Japanese War. 56 of 124 of Japan's Zhejiang-Jiangxi Campaign, launched to punish anyone suspected of aiding the Doolittle raiders in China. Roughly 250,000 Chinese will be killed. PTO - Alaska: Day 33 of 435 of the Battle of Kiska, Aleutian Islands. PTO - Malaya: Day 141 of 357 of the Battle of Timor Island. ETO - UK: Twelve people are killed when a German bomb hits the Whitehall Cinema on London Road during an afternoon matinee. 184 people were watching a film starring Hopalong Cassidy at the Whitehall Cinema on London Road. The film was interrupted by an air raid warning at approximately 5:05 pm, but as there had been many false alarms, not many people took notice and they carried on watching the film. A lone German bomber circled over the area 2 or 3 times before dropping a single bomb at approximately 5:10 pm. The roof of Whitehall Cinema exploded as the bomb struck. The roof split in two and the entire structure caved in. Adults and children were instantly killed in their seats. Russian Front - North: Day 670 of 872 of the Siege of Leningrad. Russian Front - North: Day 431 of 658 of the Siege of the Kholm Pocket. Russian Front - Center: Day 5 of 50 of the Battle of Kursk, Russia. The Soviets claim to have destroyed 2,000 German tanks in the last four days. MTO - Italy: Day 1 of 40 of the Battle of Sicily. Operation HUSKY begins with US and British dropping paratroopers in during the night. Hundreds of US troops miss their target areas and are drowned at sea while others are widely scattered about. RAF and US Air Forces provide air support. Once the Axis forces had been defeated in Tunisia, the Allied strategic bomber force commenced attacking the principal airfields of Sardinia, Sicily and southern Italy, industrial targets in southern Italy and the ports of Naples, Messina, Palermo and Cagliari (in Sardinia). The attacks were thus distributed in such a way as to maintain uncertainty as to where the next move of the Allied land forces would be, in order to pin down Axis aircraft and prevent them being ordered to Sicily. Strategically, Operation HUSKY achieved the goals set out for it by Allied planners. The Allies drove Axis air, land and naval forces from the island; the Mediterranean's sea lanes were opened and Italian dictator Benito Mussolini was toppled from power. It opened the way to the Allied invasion of Italy. The plan for Operation HUSKY called for the amphibious assault of the island by two armies, one landing on the south eastern and one on the central southern coast. The amphibious assaults were to be supported by naval gunfire, and tactical bombing, interdiction and close air support by the combined air forces. As such, the operation required a complex command structure, incorporating land, naval and air forces. At the time, it was the largest amphibious landing in history. To distract the Axis, and if possible divert some of their forces to other areas, the Allies engaged in several deception operations, the most famous and successful of which was Operation MINCEMEAT. The British allowed a corpse disguised as a British officer to drift ashore in Spain, carrying a briefcase containing fake secret documents which supposedly revealed that the Allies were planning to invade Greece and Sardinia, and had no plans to invade Sicily. 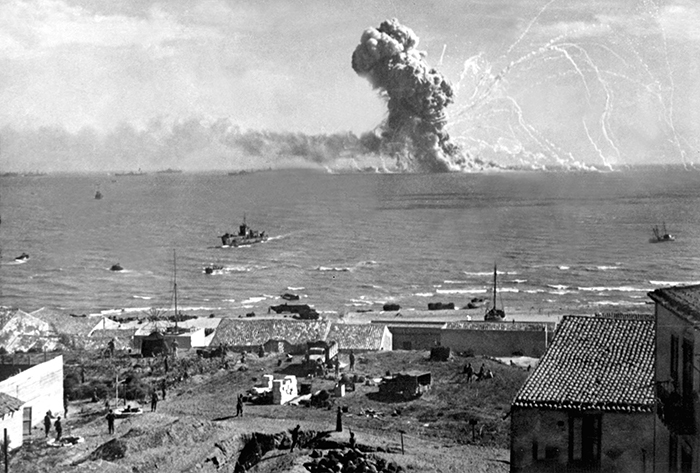 German intelligence accepted the authenticity of the documents with the result that the Germans diverted much of their defensive effort from Sicily to Greece. Field Marshal Erwin Rommel was sent to Greece to assume overall command. A group of "R boats" (German minesweepers and minelayers) was transferred from Sicily, and three additional minefields were laid off the Greek coast. Three panzer divisions were moved to Greece - one from France, and two from the Eastern Front. The latter was perhaps the most critical move - reducing German combat strength against the Russians in the Kursk salient. Still, there were a large number of German and Italian soldiers on Sicily when the invasion started. The Germans in particular had soldiers in Sicily that they had withdrawn from North Africa and had not yet reassigned to the Eastern Front. MTO - Greece: US 9th Air Force bombs the airfields at Maleme in Crete. CBI - Burma: US 14th Air Force bombs the railroad bridge on the Mu River between Ywataung and Monywa. CBI - China: Day 2,194 of 2,987 of the 2nd Sino-Japanese War. PTO: Day 44 of 47 adrift in a raft for the survivors of B-24 GREEN HORNET that crashed 850 miles from Hawaii. PTO - Alaska: Day 398 of 435 of the Battle of Kiska, Aleutian Islands. PTO - New Guinea: Day 79 of 148 of the 2nd Battle of Lae-Salamaua. US 5th and 13th Air Forces provide air support. PTO - Solomon Islands: Day 20 of 67 of the Battle of New Georgia. US 5th and 13th Air Forces provide air support. US troops advance westward toward the airfield at Munda as the US 1st Raider Battalion attacks the island of Enogai. The Japanese begin bringing in reinforcements from Kolombangara. ETO - UK: Day 27 of 86 of the V-1 "Buzz Bomb" offensive on Britain. ETO - France: Day 34 of 49 of Operation OVERLORD, the Allied invasion of Normandy, France, known forever simply as D-Day. D-Day+33: Allied Air Forces provide air support. US troops begin pushing toward St Lo. ETO - France: Day 34 of 62 of the Battle of Caen. British and Canadian troops finally capture Caen which has been reduced to a pile of rubble. Germany: About 2,000 Hungarian Jews are transported to Auschwitz Concentration Camp. These will be among the last Jews to be deported out of Hungary with Miklós Horthy's authorization. Russian Front - Finland: Day 15 of 15 of the Battle of Tali-Ihantala. The results of what became the largest battle in Scandinavian history, the Soviets are defeated and forced to withdraw. Russian Front - Finland: Day 19 of 50 of the Battle of Karelia. Soviet troops continue their offensive against the Finns in eastern Karelia between Lake Ladoga and Lake Onega in northern Russia. Russian Front - North: Day 159 of 191 of the Battle of the Narva Isthmus, Estonia. Both German and Soviet troops remain locked in their defensive positions. The Soviets launch major offensives from east of Riga and west of Psovsk. Russian Front - Center: Day 5 of 16 of the Battle of Vilnius, Lithuania. Russian Front - Center: Day 5 of 27 of the Battle of Siauliai, Lithuania. Russian Front - Center: Day 5 of 23 of the Battle of Belostock, Poland. MTO - Romania: US 15th Air Force bombs the oil refineries at Ploesti. MTO - Italy: Day 24 of 34 of the Battle of Ancona (north of Rome). Allied Air Forces provide air support. The British suffer 25% casualties while capturing the fortified village of Malan. CBI - Burma: Day 127 of 166 of the UK's Operation THURSDAY. US 10th Air Force provides air support. CBI - Burma: Day 122 of 147 of the Battle of Myitkyina. US 10th Air Force provides air support. CBI - Burma: Day 100 of 302 of the Chinese Salween Offensive. US 14th Air Force provides air support. CBI - China: Day 2,560 of 2,987 of the 2nd Sino-Japanese War. Day 84 of 259 of Japan's Operation ICHI-GO. Day 18 of 48 of the Battle of Hengyang. US 14th Air Force provides air support. CBI - India: All Japanese resistance in the Ukhrul area on India-Burma border is crushed by the British. PTO - Dutch New Guinea: Day 8 of 61 of the Battle of Noemfoor. Although the island has been declared secured, bitter fighting from Japanese continues. PTO - Marshall Islands: US 7th Air Force bombs in the Jaluit Atoll. PTO - Mariana Islands: Day 25 of 25 of the Battle of Saipan. US Marines defeat the Japanese on Saipan after a final Banzai charge is launched. A total of 27,000 Japanese and 3,116 Americans have been killed on Saipan. PTO - New Guinea: Day 44 of 83 of the Battle of Biak. There are still 3,000 Japanese soldiers on the island who won't give up. PTO - New Guinea: Day 208 of 597 of the Battle of New Britain. US 13th Air Force provides air support. PTO - New Guinea: Day 79 of 481 of the Battle of Western New Guinea. 5th Air Force provides air support. PTO - New Guinea: Day 26 of 80 of the Battle of Lone Tree Hill. PTO - Solomon Islands: Day 252 of 295 of the Battle of the Bougainville Islands. US 13th Air Force provides air support. Atlantic: The Brazilian cruiser BAHIA explodes and sinks in the North Atlantic with the loss of nearly 300 men. While most likely this was an accident, some persist that she had been torpedoed by a German U-boat fleeing to South America. CBI: US 14th Air Force hits targets in China and French Indochina. CBI - China: Day 2,925 of 2,987 of the 2nd Sino-Japanese War. The USS SEA ROBIN sinks a small Japanese patrol boat in the East China Sea. PTO - Borneo: Day 30 of 67 of the Battle of North Borneo. US 5th and 13th Air Forces provide air support. PTO - Dutch East Indies: Day 9 of 21 of the 2nd Battle of Balikpapan. The US Coastal minesweeper YMS-84 hits a mine and sinks off Balikpapan. PTO - Japan: US 20th Air Force B-29s fire bomb the Japanese urban areas of Senai, Sakai, Wakayama, Gifu and the oil refinery at Yokkaichi. PTO - New Guinea: Day 560 of 597 of the Battle of New Britain. US 10th Air Force provides air support. PTO - New Guinea: Day 444 of 481 of the Battle of Western New Guinea. US 10th Air Force provides air support. PTO - Philippines: Day 262 of 299 of the 2nd Battle of the Philippines, aka the Liberation of the Philippines or the Philippines Campaign. PTO - Philippines: Day 207 of 244 of the Battle of Luzon. The battle is said to over but hold-outs will continue fighting until the end of the war. PTO - Philippines: Day 122 of 159 of the Battle of Mindanao Island. The battle is said to over but hold-outs will continue fighting until the end of the war. PTO - Philippines: Day 114 of 135 of the Battle of the Visayas region. The battle is said to over but hold-outs will continue fighting for several weeks. The design, creation and use of British air raid shelters, the different types, their strength and weakness and people's experiences of staying in them.